If you would like to be contacted about this course which will take place when we have enough interest, please express interest here. This course is designed to give you a hands on learning approach to the basics of electronic music production. We will be learning to use synthesizers, how to create sample sets and how to start mixing your own material. Whether you’re new to the audio world, or you want to reinforce or add to what you’ve already been doing, this course will give you good foundations to set you in the right direction towards making your own beats! Understand and put into practice basic signal flow (analog and virtual) for wiring up mixers, monitors, and microphones into a computer via an audio interface. Operate a typical analog and virtual mixing console. Create their own sampler instruments and use them to create tracks with MIDI controllers. Understand the basics of sound synthesis and be able to operate a simple software or hardware synthesizer. Set up and record live instruments. Create and mix their own material at a basic level making creative use of effects. Find affordable gear to build up a small home studio. By the end of the course each student will have at least one tune that they have created, using their own sampler instruments, synthesizer patches, and audio recordings. They will also have mixed it themselves, at a basic level. 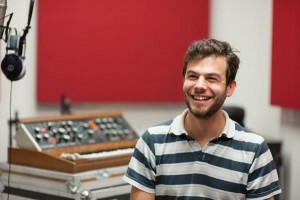 Ed Zuccollo is a musician who has been combining the use of computers, synthesizers, effects, and recording live instruments to make music across genres such as hip hop, dubstep, drum and bass, ambient and trip hop. Self taught from the age of 16 he has since worked on a number of albums and is currently shifting his focus back to his solo work which includes heavy use of sampling, software and hardware synthesizers and effects.